PHILIPSBURG–The board of the Dutch Disaster Fund NRF pledged two million euros in November 2017 for recovery projects after Hurricane Irma caused major damage to the SSS islands Saba, St. Eustatius and St. Maarten. The focus was on restoring and strengthening social resilience on the islands through the re-building and strengthening of social networks and activities. The fund was publicly launched in March 2018, with a deadline of July 31. Some 51 project proposals were submitted to the NRF assessment committee from the Netherlands (5), Saba (5), St. Eustatius (4) and St. Maarten (37). The large number of applications and the broad diversity of the projects submitted have shown that the fund has successfully reached out to a large part of civil society on the different islands and in the Netherlands. The assessment committee carefully reviewed the submitted proposals and has granted financial support to 30 non-governmental organisation (NGOs). Projects will be funded on each of the three islands. The projects focus on a broad spectrum of sectors, such as care and wellbeing, education, disaster preparedness, sports and culture, all as media to strengthen society. The total amount of funding awarded to those 30 NGOs is US $ 2,259,866 (1,951,329 euros). Twenty of the 30 NGOs were granted the full amount requested, while 10 received partial grants, of which 22 were projects in St. Maarten, three in Saba, two in St. Eustatius and two in the Netherlands for projects in St. Maarten. Many projects are already in the implementation phase, while some are still in the preparation phase, and two are busy finalising their projects – a Child Focus Foundation playground for children in Saba and the provision of household equipment (stoves, beds, refrigerators) to clients of the White and Yellow Cross Care Foundation in St. Maarten). The projects are to be finalised within 1.5 years – by the end of April 2020. The NRF will carefully monitor the implementation and progress as well as finalisation of the projects, in part by support of local advisors, digital communication, as well as visits from representatives of the committee. The first visit, which took place in the third week of January, has just been concluded with representative Rene Grotenhuis visiting all three SSS-islands and many of the grant recipients. All recipients were also invited to a general information session stimulating partnerships, getting to know each other, as well as what other projects are ongoing, where all had to present a pitch. The National Institute of Arts will hold its auditions for a Youth Orchestra on January 26. Kidz at Sea is already training its second group of participants to acquire their internationally-recognised maritime certifications that will open doors for them to get jobs in the rapidly recovering maritime sector. 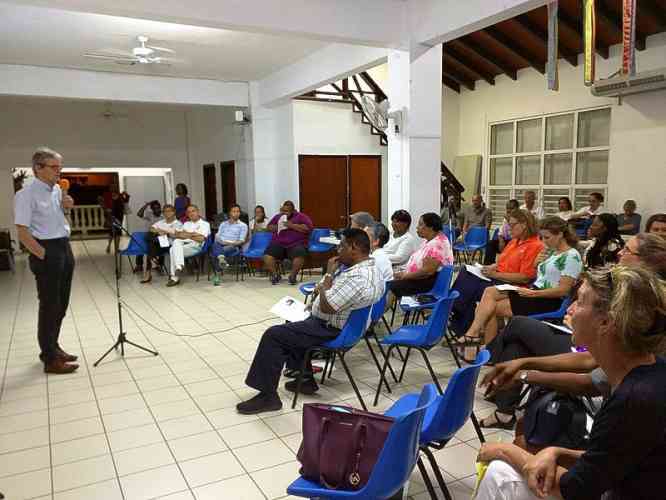 St. Maarten Development Fund is organising the first meetings with community councils to strengthen their capacity and prepare them for their role in disaster preparedness and disaster response. Niecy’s Sports Foundation in St. Eustatius is assisting with getting food to those in need through its after-school facility for children. Saba Nature Education is organising nature-oriented activities for children to strengthen their connection to each other and to the nature of Saba. These are just a small selection of all that is happening through civil society organisations with the support of the Dutch Disaster Fund. Future visits are in the planning as well as open communication on the progression of all funded projects.